The Texas football team will face the University of Georgia for just the fifth time ever when the Longhorns and Bulldogs square off Jan. 1 in the 85th annual Allstate Sugar Bowl (photos courtesy of georgiadogs.com, texassports.com and allstatesugarbowl.org / graphic by Horns Illustrated). NEW ORLEANS, La. — The Texas Longhorns will be spending New Year’s Day in New Orleans. 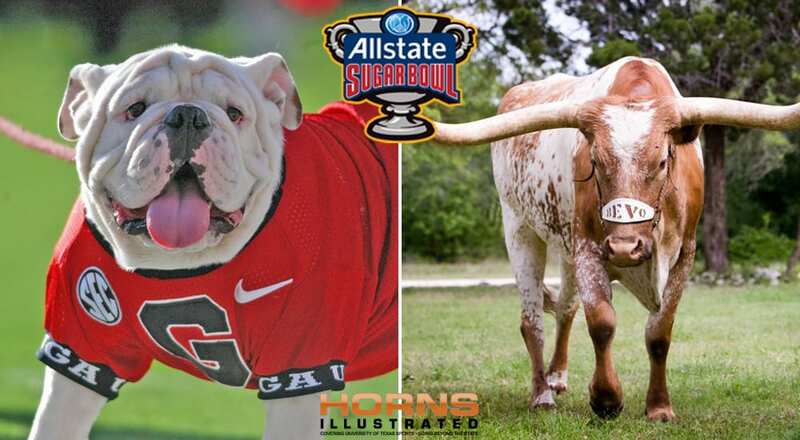 A day after falling to Oklahoma in the Big 12 championship game, the Texas Longhorns got some good news when it was announced that UT will face Georgia in the 85th annual AllState Sugar Bowl. The game will be played at 7:45 p.m. (central time) Jan. 1 at the Mercedez-Benz Superdome, and will be broadcast on ESPN. Herman’s counterpart in the game, Georgia head coach Kirby Smart, said his past experiences in the Sugar Bowl only increase his excitement about the matchup. “This will be an outstanding experience for our coaches, players, and fans," Smart said. "Most of our coaches and none of our players have had the opportunity of a Sugar Bowl trip and I'm especially proud for our seniors who have worked so hard over the last 12 months. It also presents a great opportunity for our fans who have been so supportive of our team throughout the season. I had the opportunity to coach in a couple of Sugar Bowl games and experienced outstanding hospitality, a dynamic city and first class competition. It also represents a great challenge playing a team like Texas who has been one of the country's most accomplished programs in college football history." The Longhorns and Bulldogs have met just four times. UT has won three of the four previous meetings, although Georgia won the most recent matchup, a 10-9 victory in the Cotton Bowl … in 1984, more than a dozen years before any player on the current team was born. Nevertheless, Herman said he is familiar with Smart and the program he runs in Athens. The game is the designated bowl game for the champions of the Big 12 and the Southeastern Conference, but Georgia and Texas earned the invitations when SEC champion Alabama and Big 12 champion Oklahoma received spots in the four-team College Football Playoff. Texas heads to New Orleans with a 9-4 overall record, including a 7-2 mark in Big 12 games, while the Bulldogs head to the Big Easy with a record of 11-2, including a 7-1 record in SEC games. While the Longhorns were disappointed to see their senior class end their careers without winning a Big 12 title, the tradition and pedigree of the game and the Georgia program have them looking forward to one more challenge for the season. “It’s going to be a ton of fun,” tight end Andrew Beck said. “Our senior class has made it our mission to get this program back to where it needs to be, and this is a reward and justification for all of the hard work. To play my last game in the burnt orange and white in the Sugar Bowl against a great program like Georgia is going to be special.